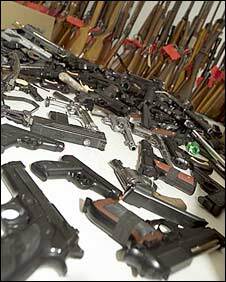 More than 120 officers will be focused on tackling gun crime across Greater Manchester after a £6.5m investment. Although firearms incidents are down across the region, more shots are being fired and gang members are "getting younger", the force says. So police bosses have boosted resources for the Xcalibre Task Force, a team set up to focus on the issue in 2004. It means the team will get additional help from murder detectives, the armed crime unit and other departments. All 12 police divisions across Greater Manchester will also have a dedicated team of officers geared to deal with gang-related crime. The shake-up is intended to build on the recent success of Operation Cougar, which has helped cut the number of gang-related shootings. The operation has included the use child protection laws to take young people at risk of gang involvement home to their parents, or even to secure care units. Deputy Chief Constable Ian Seabridge said: "Unfortunately, a culture pervades among young people in certain communities that being a member of a gang offers an attractive lifestyle and a sense of belonging. "What we are also beginning to see, and of concern to us, is that younger people are getting involved in these gangs." In 2005, 75% of all shootings in Greater Manchester were believed to be gang-related. By 2007, this had dropped to 57%. But according to Xcalibre intelligence, none of the shootings recorded since April 2008 are gang-related. A Greater Manchester Police spokesman said Operation Cougar had had a "massive impact" on gang-related shootings. "We constantly re-evaluate the way in which we handle gun crime and adapt our targets accordingly," Mr Seabridge added. "When we set up Xcalibre in 2004, the overall aim was for gun-free streets, and that still remains our aim today. "To help us achieve this, a large portion of this extra cash will go towards building on the successes we've had in cutting the supply of firearms, removing guns from our streets and bringing offenders to justice."